The ruling in the suit over construction at the Memorial Stadium oak grove is expected this coming Wednesday. Do hear that heavenly music? It’s angels sighing. You thought the whole thing was dead, didn’t you? The Clog had let the issue lie, nothing was going on (except continuous living in trees and occasional animal-like calls). But now, we might smell a hint of closure. The ruling was expected earlier in March, but the arguments were extended for extra expert testimony about the Hayward fault. In the meantime–and we can’t believe we’re admitting this–we sorta forgot about the whole issue. The campus will hold a press conference after this week’s ruling. How will you celebrate/commiserate? 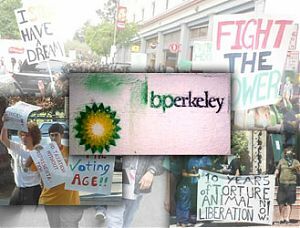 Today, the UC Berkeley LiveJournal community highlighted an opinion piece from the Chron about the Nuclear-Free-Vegan-Save-The-Trees Zone, a.k.a Memorial oak grove. LJers responded mostly supporting the piece, agreeing that the tree-sitters are wasting their time. We think that comment alone deserves a slow clap. Krista, our resident NFVSTTZ-obsessed, would stand up, a tear forming in one eye and dramatically smack her hands together. The clapping would be infectious, and soon enough, the rest of Berkeley would follow in kind. The editorial to which she refers, in fact, came after the Clog posted a video from the TV story. Yeah, so we’re obsessed with the tree people … because it’s all so absolutely ridiculous, even for Berkeley. Earlier: Without the Axe, How Will We Cut the Trees Down? Without the Axe, How Will We Cut the Trees Down? The Nuclear-Free-Vegan-Save-The-Trees Zone in its present state (that is, complete with tree-sitters) celebrated its one-year anniversary on Sunday. Since last Dec. 2, Memorial Stadium’s oak grove has been occupied by hippies with a radical agenda against UC Berkeley’s plan to cut down some trees and replace them with more trees and a fancy new athletic facility. As tree people know, the university has no right to do what it will with its own property, including kick trespassers off it. Oh, wait. We’re sure no one is happier about the cheap lease than leader of the pack Zachary RunningWolf, who seems to think the estimate of the university’s site-specific expenses published Friday is low, and yet we find $367,000—about $1,000 per day so far—to be a bit much for the university to just toss at sustaining guests who have far overstayed their welcome. Surely the money must be going somewhere important. People call us crazy monkey hippies, but this is the greatest thing I’ve ever done. I feel like I’m truly alive. Aside from missing the part where “Shem” actually addresses the “crazy monkey hippie” characterization (remember, for the former debaters out there, silence is concession), we find it hard to believe that vandalizing trees, campaigning against fellow cause supporters and ignoring 23,000 other trees on the university’s chopping block are among the greatest things this protester has experienced. Nevertheless, we toast to the tree people’s efforts to sustain a really annoying, probably pointless but surprisingly newsworthy year up at the NFVSTTZ. 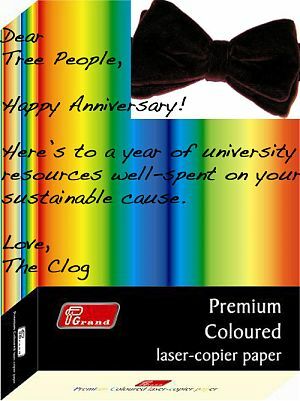 From the Clog to you, oh tree people, we give you a ream of paper—the traditional one-year wedding anniversary gift—as a symbol of the print the press has wasted writing about you and the paper that could be made from all the trees and platforms you folks are sitting in.